Key difference: Both debit and credit cards are small rectangular plastic cards issued by a financial institution, such as a bank or credit union. The main purpose of a debit card is to allow the account holder to access the money in their account without actually traveling to the bank during official bank hours. Whereas, the credit card is used to buy things or make payments on a credit line. Both debit and credit cards are small rectangular plastic cards issued by a financial institution, such as a bank or credit union. The main purpose of a debit card is to allow the account holder to access the money in their account without actually traveling to the bank during official bank hours. Whereas, the credit card is used to buy things or make payments on a credit line. A debit card is linked to the card holder’s bank account. Whenever, the debit card is used the bank account of the owner is debited from the said amount. Hence, the name: debit card. If there is insufficient amount in the bank account, they the debit card will be declined. A credit card, on the other hand works completely differently. 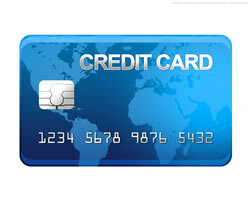 A credit card has a credit limit on it, as allotted to the owner by the credit card company. The owner can charge the credit card as many times as he wants, until the total reaches the credit limit. The owner will then get a billing statement at the end of the month or at the end of the billing cycle. This statement will show how much the owner has spent in the previous month and how much is his balance. The owner now has a choice, he can either pay the amount in full like any bill, or he may pay the minimum amount as required by the company. The rest can be paid on a later date, with interest, as applicable. The advantage of credit cards and debit cards is that the owner need not carry cash on him. The cards also make big transaction easier, faster and hassle free. The cards are also subject to more scrutiny than regular cash; hence it is less likely for theft and fraud. Rectangular plastic card with name of institution. Feature the logo of a major payment processing network, such as Visa, or MasterCard. Rectangular plastic card with name of institution. May or may not feature the logo of an ATM network provider. 16 digit account number, different from the bank account number. 16 digit card number, different from the bank account number. The card holder must sign a signature panel on the back of card. The card holder must sign a signature panel on the back of card. May or may not have a photo of the owner. Any ATM machine that features the logo of the processing network that handles the card. To make purchases at Point Of Sale (POS) machines in stores, by either entering their PIN or swiping the card and signing for the transaction. Can be used to make purchases online or on the phone. Any ATM machine that features the logo of the processing network that handles the card. To make purchases at Point Of Sale (POS) machines in stores, by swiping the card and signing for the transaction. Can be used to make purchases online or on the phone. ATM machines across the world carry the logos of Visa, MasterCard, American Express, etc. Card holders are issued a PIN number to use in care of withdrawals. PIN may or may not be used for purchases. PIN are generally not used for transactions, however may be used for cash withdrawals. A debit card is linked to a bank account. Whenever, the debit card is used the bank account of the owner is debited from the said amount. 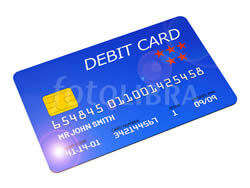 A credit card has a credit limit on it, as allotted to the owner by the credit card company. The owner can charge up to the credit limit. At the end of the billing cycle, the owner can pay the whole amount or pay it later with the interest applicable.